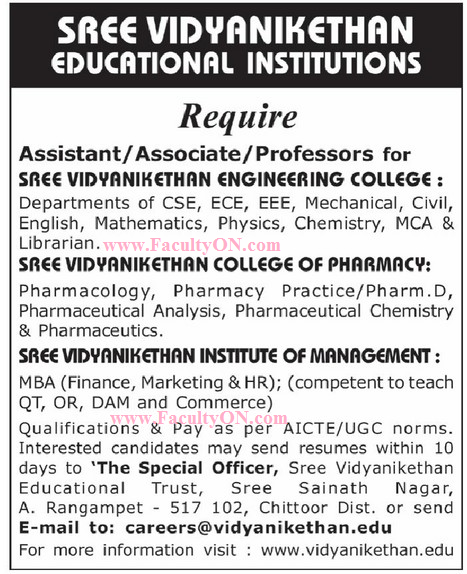 Sree Vidyanikethan Institute of Management, Chittoor has advertised in the EENADU newspaper for recruitment of Professor / Associate Professor / Assistant Professor jobs vacancies. Interested and eligible job aspirants are requested to apply within 10 days from 10th April 2018. Check out further more details below. About College: Sree Vidyanikethan Institute of Management was found in 2007 by Sree Vidyanikethan Educational Trust, a multi-core, non-governmental service organization. The Institute is set up 14 k.m. away from Tirupati Town, in a lush green campus in response to the growing demand for quality education and training in the field of management and entrepreneurship.